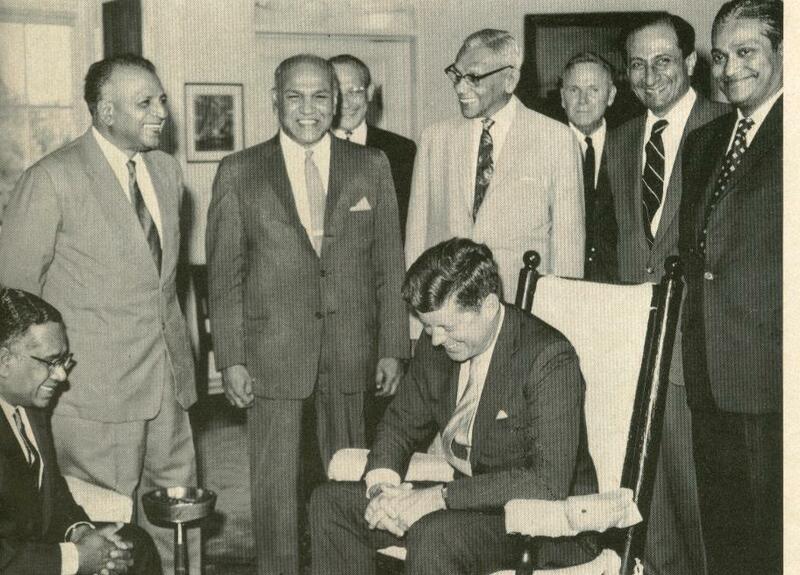 President John F.Kennedy in the Oval Office at the White House with a delegation from Ceylon in 1961. It was President Kennedy who despatched Duke Ellington to Ceylon, on a goodwill tour of the Far East. It was 1963, President John.F Kennedy thought it would be a good idea to win the ‘hearts and minds’ of people in the Far East through the medium of music and jazz in particular. President Kennedy appointed ‘Duke’ the legendary American Jazz pianist, Duke Ellington as his Music Ambassador. Duke Ellington in Ceylon in 1963. Duke Ellington was despatched to the Far East on a goodwill tour under the patronage of the U.S.State Department. 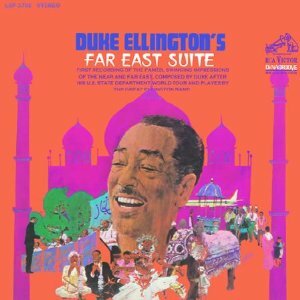 Duke Ellington and his famous orchestra went to Ceylon (now Sri Lanka), Egypt, India, Iraq, Jordan, Lebanon, Pakistan, Persia (now Iran), and Turkey. 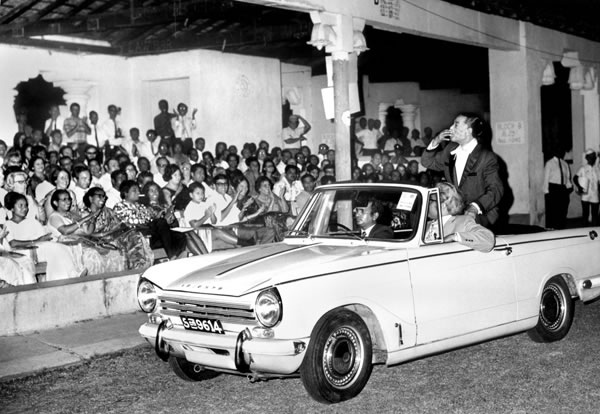 Duke Ellington arrives for his sell out concert in Colombo, Ceylon (now Sri Lanka) seated on a Triumph Herald. Sri Lankan broadcaster Vernon Corea and his family were in the audience in 1963. Duke spent a few days in Ceylon and performed to a packed stadium in Colombo. 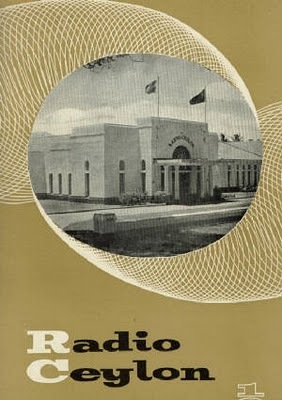 South Asia’s leading radio station, Radio Ceylon was a ‘must visit’ for Duke Ellington so Duke was whisked to Torrington Square for interviews and a concert in the auditorium. Vernon Corea was a real jazz enthusiast. He was an accomplished jazz pianist and he played by ear. He enjoyed listening to ‘Satchmo’ the great Louis Armstrong. He included the music of Louis Armstrong and Duke Ellington on his radio programmes on Radio Ceylon. Vernon met Duke Ellington in a studio at Radio Ceylon and the great man even autographed one of his records for Vernon. He took his children with him to meet Duke Ellington, the Corea Family were also present at the amazing concert in Colombo in 1963. Far East Suite - the Duke Ellington album - Kandyan dancers and caparisoned elephants in the Kandyan Perahera on the front cover. Duke Ellington thrilled audiences in Colombo. After his visit he released an album called the Far East Suite to commemorate his goodwill tour of the Far East. The front cover of his album, Far East Suite included pictures of Kandyan dancers and a caparisoned elephant from the Kandy Perahera. CONTRARY to its nowadays’ apparently diminished and rather muted disposition as a commercially well-established art form, jazz was Sri Lanka’s most acclaimed and urbanely widespread style of music in the 40s and 50s. Although one hardly gets to hear any jazz being played in the city’s famous pubs, sports clubs or night clubs any more than a beat group playing one or two jazz songs from a podium as of today, the spicy sounds of the Caribbean and Mexico were once gaining wider notice in the country’s big hotels. Burgeoning Jazz sessions were taking place at the Galle Face Hotel in Colombo, the Taprobane and the Mount Lavinia Hotel. The musicians were all European nationals for there was no local jazz bands or musicians in Sri Lanka during those early years of post-independence. Most of these European bands resembled Swing or Big Bands in the US while some of them resembled the characteristics of Territory Bands that were playing jazz in smaller United States cities. There were no electronic keyboards or electric guitars available at the time of the development of jazz. The instruments in use were pianos, clarinets, harmonicas, oboes, saxophones, trumpets, drums and semi acoustic-guitars. The European jazz musicians brought these instruments to the country to play their music. This is the early history of the beginning of jazz music in Sri Lanka. The current article has been composed by us to serve as material for future reference outlining the history of jazz music in Sri Lanka. The city of New Orleans with a well-established large black population is regarded as the place of the origin of Jazz and or its evolution by many authorities. Jazz great Louis Armstrong, and his teacher, one of the first great cornetist Joe “King” Oliver, and other influential musicians including Jelly Roll Morton hailed from New Orleans. In the early years, Brass bands paraded in New Orleans and played to comfort families during funerals and performed at numerous functions including social dances, a character that is discernible from so call “Papare” bands in Sri Lanka. A Papare band uses trumpets, a bass drum for beat, a pair of cymbals and most of these bands play simple jazz standards like “When the Saints Go Marching In.” After the EU jazz bands left the country, several Indian musicians came to Sri Lanka from Goa, who settled in the country, said Suriyakumar. Among these Goanese families were good jazz musicians. The Menezes family was one among them with Roger Menezes. The family of Manilka Vasagar was another family of jazz musicians from India. Lucky , Valantine and Nesen Vasagar became acclaimed jazz musicians. Among the characters of musical importance were Erin De Selfa, who was the wife of Donovan Andre. Erin brought down a number of foreign jazz bands to the country. Jazz singer Yolande Bavan is another key figure. She went to America where she formed the famous Lambert Hendrix and Bavan trio, which received international acclaim. The first generation musicians played predominantly light jazz or ball room music and jazz standards. Saxophonists Harold Seneviratna and Edgar Hebber, Milroy Passe De Silva, guitarists Gazaril Amith, pianists Eric Batholomeusz, Sunny Batholomeuz, Dr. Gulasekaran (Dr. Gulli), Jimmy Emmanual, Jerry Crake and Raddy Fereira features prominently in the early development of jazz in the country. This was the time the piano style, which developed from ragtime was popular. The first generation includes drummers Faleel Ziard and Cass Ziard, pianist\drummer Adrian Ferdinandz, Patrick Nelson Combo and Arden Nelson Combo. As pointed out by Suriyakumar the musicians who came after the first generation of jazz musicians took the level of music to a higher level. “There are no pure jazz musicians in Sri Lanka for the fact that it will be hard to earn one’s bread if one is a pure jazz musician here,” he said. “The basis of jazz is improvisation. technically speaking if you are playing “Funeral March” and improvise on it, it means you are playing a jazzy version of Funeral March,” he explained. Helen Lucus, Steurt De Silva, Sisil Rodrigo and trumperters Papa Miskin and Latiff were among those who played jazz in Sri Lanka. Guitarists Raja Jalaldeen, Dilan Lye, Raj Seneviratna and Derek Wickremenayake are among the second generation of musicians. Also the pianist\singer Priyanthi Manamperi, Noeline Honter and Dalrene Suby. Musicians Aruna Siriwardena, Upali Fernando, Sunil De Silva (the percussionist for Santana), Hussain Jiffrey (who plays for George Benson and Yani) have also contributed much to the development of jazz. Among those who promoted jazz music in Sri Lanka are Tommy Perera, Tita Nathaniez, Mahes Perera, former Minister Harendra Corea and Bala Namasvayam. Jazz Unlimited, the jazz club of Sri Lanka to promote jazz music organise sessions of jazz music every month at CR&FA with the participation of many up and coming jazz bands and singers. Among them are senior players like Harsha Makalanda and Dilrukshi Sirimanna.